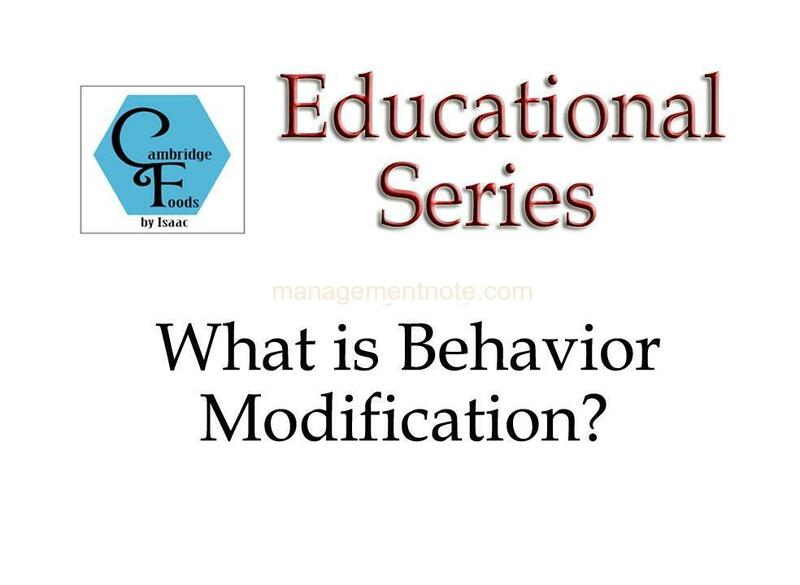 Behavior modification is the process which involves making specific behavior occur more or less often by systematically managing its cues and consequences. It is simply we can say application of reinforcement concepts to individuals in the work settings for the proper functioning of the organizational goals by decreasing unwanted behavior and help employees to show suitable workplace behavior. This is the first step involved in Organizational Behaviour Modification process. In this step managers need to identify which behaviors are highly desirable in organization and which are undesirable in organization.The managers need to specify which behavior is wanted or need to be changed for the sake of the organization.If the behaviors can be seen and measured then only second step is applied otherwise it cannot be applied. for e.g Absenteeism , tardiness or promptness , complaints or constructive criticism ,etc are the beahviors that should be modified and if such behaviors are modified then good results can be obtained. collect and analyze the performance data before,during and after the Organizational Behaviour Modification program from records.The baseline data is collected ( ie; the data collected before the beginning of change process) and on the basis of this ,the success and failure of the Organizational Behaviour Modification program is evaluated. The measurement of behaviour will also help the managers in determining the success in changing the employees’ behaviour. The main objective of this step is identifying the consequences of the behavior. For. eq. If any employee in an organization work hard then does he/she get reward or not, or just gets tired. This is the fourth step involved in Organizational Behaviour Modification process.Once the critical behaviours have been identified and the circumstances which cause such behaviours have been determined, the next step will be to develop an effective intervention strategy. In this step managers need to design intervention strategies to strengthen desirable critical behaviours and weaken undesirable critical behaviours through positive or negative reinforcement, extinction or punishment.Using a particular strategy depends upon the type of situation faced. After developing and implementing a particular strategy, the frequency of resulting behaviour is measured. If a behaviour change has occurred in the right direction, the manager will select a reinforcement schedule that will maintain the desired behaviour. This is the Last step or final step involved in Organizational Behaviour Modification process.The main focus of this step is identifying the success or failure of Organizational Behaviour Modification program.In this step manager evaluate whether the intervention strategies are working properly or not which will show whether the undesirable behaviours have been substituted by desirable behaviour or not. If there has been a change in behaviour, whether it is permanent or just temporary.Further, the evaluation will also show whether there is improvement in the performance or not.If there is a positive change, it suggests that the interventions are successful. Great post however I was wondering if you could write a litte more on this subject? I’d be very grateful if you could elaborate a little bit more. Kudos! I would like to thnkx for the efforts you’ve put in writing this site. I am hoping the same high-grade blog post from you in the upcoming as well. Actually your creative writing abilities has inspired me to get my own website now. Really the blogging is spreading its wings rapidly. Your write up is a great example of it.